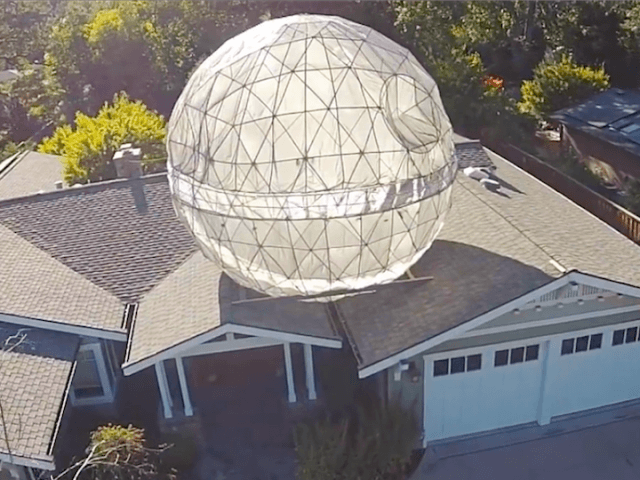 The Death Star is stalking a Northern California home. 2,000 square feet of PVC pipe and 162 joiners were used to make the skeleton of the giant 23-foot, 400-pound homemade ornament at the Lafayette, California home of the Powell family. Four of the six Powell family members count themselves fans of the Star Wars movies. Three of the children and father Colby Powell conceived the idea two years ago, but it was tabled until just this year, according to Contra Costa Times. The massive structure is covered with two military surplus parachutes. “The (LED) lights show through them, and there’s this eerie glow,” the elder Powell told the Times. Green lights represent the ship’s superlaser. Last March, Legoland unveiled a special Star Wars Death Star exhibit, complete with Luke Skywalker maneuvering his X-Wing fighter through a combat zone. The construction took half a million Lego bricks to complete.